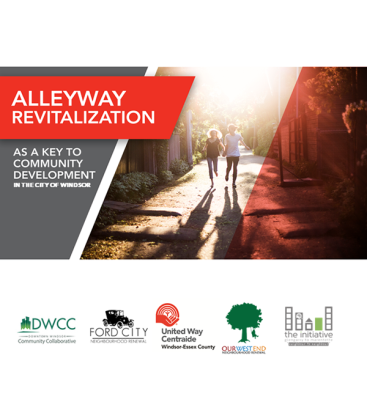 The United Way/Centraide Windsor-Essex County is touting the revitalization of alleys as key to developing Windsor neighbourhoods. The agency released a report on Thursday aimed at starting the conversation. The United Way is offering suggestions to turn alleys into vibrant spaces that add value for residents and generate additional tax revenue or cost-cutting opportunities for municipalities. The idea is to re-purpose some alleys for other uses. The agency said closed alleys would be more economically productive than they are currently. “Returning the land to the residents, where alleys don’t interfere with city services or commercial deliveries, could turn them into tax revenue-generating land for the city in perpetuity,” said the United Way. The organization added closed alleys could be used for community events or turned into restaurant patios. The report was created based on questions from United Way’s four Neighbourhood Engagement Strategy partners, including Downtown Windsor Community Collaborative, Ford City Neighbourhood Renewal, Our West End, and The Initiative: Glengarry to Marentette, Neighbour to Neighbour. · Create more affordable housing and attract young people back to the city centre by creating laneway housing which fronts onto alleys at the back of existing properties. This increases the value of the property and generates additional tax revenue, and creates co-habitation and multi-generational living options, improved safety on alleyways, and a slower pace of development compared to new construction – provided that alleyways are properly lit and well-kept. · Close some alleys to reduce calls for service to 311, and reduce the need for by-law enforcement and maintenance. · Name alleys and give them a ‘place’ status (like Maiden Lane in Windsor or in Sacramento, CA), contributing to districting efforts, and highlighting the unique characteristics and history of the neighbourhoods. · Create greenways to reduce heat islands in the core, enhance urban biodiversity (like Montreal, QC), and help to prevent rainstorm-related flooding (like Chicago, IL) – even providing opportunities for resident-led community gardens, art projects or safe outdoor spaces (like in Toronto, Vancouver, Jacksonville, FL and Middlesbrough, UK). · Develop more commercial corridors in alleys, driving economic activity and civic uses, such as restaurant patios (like Calgary), farmer’s markets (like Winnipeg, MN), or pop-up events or block parties (like Hamilton and Aurora, ON). · Create cycling laneways to enhance cycling connectivity across the city, and fill in gaps in the City’s forthcoming Active Transit Master Plan, when adding bike lanes to roads isn’t feasible. · Increase maintenance and by-law enforcement in alleys. · Better track and publicly report data related to blight, crime, and dumping that is happening in alleys to measure improvement over time. · Create separate by-laws for alleys, differentiating them from city roads, to increase potential community and commercial use.